This species is accepted, and its native range is SE. Kenya. Evergreen shrub or tree 3–6 m tall. Inflorescence with flowers borne with the leaves, axillary, single or rarely in fascicles, sessile. Bracts ± 4, ± orbicular, the lowest ± 3 mm long, 4 mm wide, increasing to 6 mm long and wide, outer surface tomentose, inner glossy, glabrous, dark brown. Male flowers with androphore abruptly contracted from the base, 2–4 mm long, 3–3.5 mm across (4 mm across at the base), thickly long stellately hairy; anthers 14, uniseriate, forming a ring 2 mm long, 5.5–6 mm wide, inner surface tomentose. Apart from the specimen from Kwale District, this species appears restricted to the forest remnants on the limestone at Chasimba. Its total area of occupancy is believed to be below the 500 km2 threshold. Only five collections are known. The main threat at Chasimba is the removal of trees for firewood and a plan to use the rock to upgrade the Kilifi to Mariakani road (Luke, pers. comm.). Cola octoloboides is here assessed as EN B2a,b(iii), i.e. Endangered. IUCN (Red List 2002) also list this species as endangered (ENB1+2c). Cola octoloboides is still imperfectly known: fruiting material has not been seen. 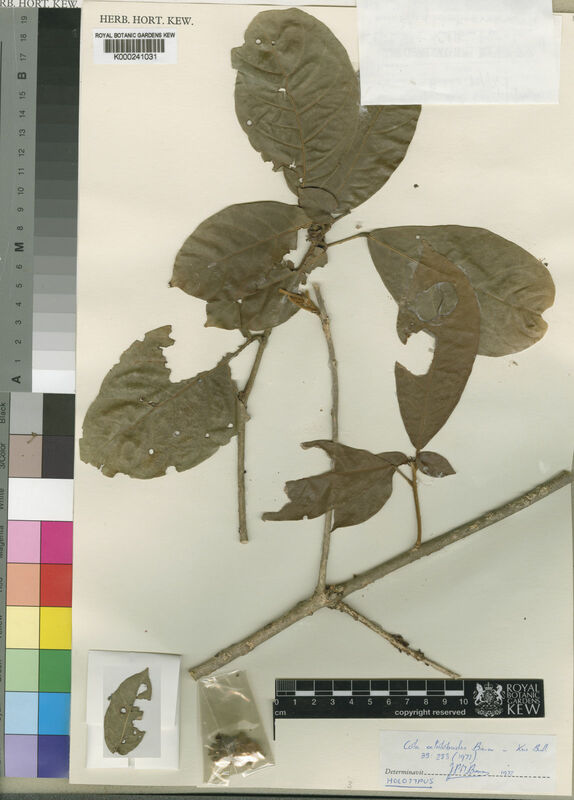 The persistent bud-scales and stipules together with the persistent stem indumentum make this one of the few East African Cola species easily recognized in the sterile state. It is most closely related to C. ruawaensis (see diagnosis of that species for distinguishing characters).